Sea transportation and Roll on-Roll off-loading (Ro-Ro) are both key in Siemens’ new offshore logistics concept launched in 2015. Now the company has commissioned its first specialised transport vessel, the Rotra Vente. It fulfils the needs for cost effective transportation of the large nacelles used in Siemens’ direct drive offshore wind turbines. The 141-meter long vessel can carry multiple 8- megawatt nacelles per trip and will connect Siemens’ coming manufacturing site in Cuxhaven, Germany with installation harbours in the North and Baltic Seas. Siemens and logistics partner deugro organisation celebrated the delivery of the ship today, together with customers and representatives of the European offshore wind industry, in the Danish harbour of Esbjerg. A sister ship is expected to be delivered in spring 2017. Designed from a base of an existing hull of a container ship the vessel was rebuilt for its new purpose at Holland Shipyard in Hardinxveld-Giessendam in the Netherlands. Part of its new equipment is a large bow door that allows Ro-Ro access to the restructured cargo deck. The deck is covered by a telescopic roof to protect the nacelles from salty seawater spray during transportation. Since the roof can be opened, Rotra Vente’s cargo can also be loaded via cranes at harbours without a Ro-Ro ramp. Due to maximum flexibility of the deck, she can also handle transports of up to nine wind tower sections per trip or three to four rotor blade sets. "With our new Ro-Ro transport vessel Rotra Vente, we are stepping into a new era of cost efficient offshore wind logistics," states Michael Hannibal, CEO Offshore of Siemens Wind Power. "When our new factories in Hull, England and Cuxhaven, Germany become fully operational, and both Ro-Ro vessels are in service as interconnection of our manufacturing and installation network, we expect savings of 15-20% in logistics costs compared to current transport procedures. This is another important contributor reducing the cost of electricity from offshore wind." "We are proud to operate Rotra Vente for Siemens, since this vessel marks a new milestone in the close cooperation we have maintained for years," says Richard Thomsen, Managing Director of deugro, the project freight forwarding division of the deugro Group "We signed the contract for this innovative logistics concept just one year ago, and we already have one highly efficient ship operational, with a second one in the shipyard." Rotra Vente’s sister ship – a transporter for towers and blades – is already under construction. 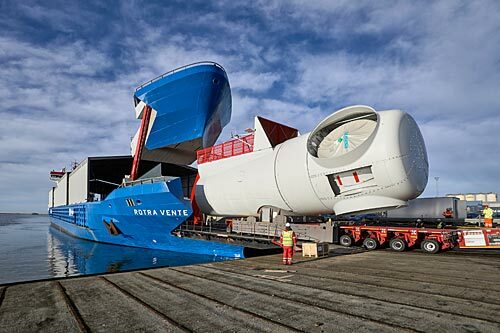 This vessel will accommodate up to 12 wind turbine rotor blades and transport them from Siemens’ production facilities in Hull, England or Aalborg, Denmark to the respective installation harbour.